Corn also known as maize is cereal plant which yields large grains set in rows on a cob. North America is the biggest producer of the corn in the world. 40% of the globally consumed corn originates from North America. It is one of the most popular cereal grains in the world. Corn like all cereal crops are members of the grass family (Poaceae). One acre of corn eliminates 8 tons of carbon dioxide from the air. Because of that, corn is one of the most important plants when it comes to the cleaning of the air. Corn was first domesticated by indigenous peoples in southern Mexico about 10,000 years ago. Native Americans taught European colonists to grow the indigenous grains, and, since its introduction into Europe by Christopher Columbus and other explorers, corn has spread to all areas of the world suitable to its cultivation. It has become a staple food in many parts of the world, with total production surpassing that of wheat or rice. Compounds extracted from corn are used in the production of plastics, rubber, solvents and fabrics. Corn is grown on every continent on earth, except Antarctica. Corn is used as livestock feed, as human food, as biofuel, as raw material in industry. There are thousands of corn hybrids, but almost all fall into six general types. Corn plants consist of a single stem or stalk with leaves and ears attached. The height of the stalks depends on the corn variety and the environment. On average, a corn plant measures 2.5 to 3 meters (8 to 10 feet) tall but the world record is over 10 meters (33 feet). Corn is used for the production of ethanol that is used as bio-fuel. Ethanol does not induce pollution of the air like conventional fuels. A leaf, which grows from each node, is generally 9 cm (4 in) in width and 120 cm (4 ft) in length. Corn is very important part of the livestock food. Unlike the corn that is used in human diet, special types of corn are used for the preparation of animal food. Male flowers are borne on the tassel terminating the main axis of the stem. They release pollen that is easily spread by wind. Corn is mostly used in the form of kernels or flour. Popcorns and tortillas are just few of numerous dishes made of corn. Nearly all baked products, beverages, snacks and canned goods contain corn in the form of corn syrup or corn starch. Elongated stigmas, called silks, emerge from the whorl of husk leaves at the end of the ear. They are often pale yellow and 18 cm (7 in) in length, like tufts of hair in appearance. At the end of each is a carpel, which may develop into a “kernel” if fertilized by a pollen grain. Corn is staple food in most countries in the world. Corn is rich source of sugar, proteins, vitamins and minerals. Each cob of corn consists of usually 800 kernels that are arranged in 16 rows. Besides selective breeding, new varieties of corn are produced via genetic engineering. Scientists can alter color and the size of kernels, improve nutritional value and develop varieties that are resistant to pests, herbicides and drought. Kernels are of various colors: blackish, bluish-gray, purple, green, red, white and yellow. Each cob of corn consists of usually 600 kernels that are arranged in 16 rows. The maximum size of kernels is reputedly 2.5 cm (1 in). In 2014, total world production was 1.04 billion tonnes, led by the United States with 35% of the total (table). China produced 21% of the global total. There are 86 calories in 100 grams (3.5 ounces) of corn. Male flowers are located on the top of the plant. They release miniature pollen that is easily spread by wind. Female flowers develop between the stem and leaves. They are tightly enveloped with leaves known as husk. Female reproductive organs (stigmas) form well known corn silk. Corn not only provides the necessary calories for healthy, daily metabolism, but is also a rich source of vitamin A, vitamin B, vitamin E and many minerals and some antioxidants. It is also high in fiber content. Corn and cornmeal (ground dried maize) constitute a staple food in many regions of the world. Corn has shallow root system which does not tolerate lack of water and nutrients in the ground. Corn is central to Mexican food. Virtually every dish in Mexican cuisine uses maize. In the form of grain or cornmeal, maize is the main ingredient of tortillas, tamales, pozole, atole and all the dishes based on them, like tacos, quesadillas, chilaquiles, enchiladas, tostadas and many more. Cornmeal is made into a thick porridge in many cultures: from the polenta of Italy, the angu of Brazil, the mămăligă of Romania, the kačamak of Serbia, to cornmeal mush in the US (and hominy grits in the South). Popcorn consists of kernels of certain varieties that explode when heated, forming fluffy pieces that are eaten as a snack. Bamboo-like stem of corn is divided in 20 nodes. 4 feet long leaves grow from each node. Corn syrup is a food syrup which is made from the starch of corn and contains varying amounts of maltose and higher oligosaccharides, depending on the grade. Size of a corn depends on the species. Most types of corn grow to the height of 8 feet. Wild species may reach 40 feet in height. High-fructose corn syrups (corn sweeteners) are widely found in juices and soft drinks like Coca-Cola and Pepsi. Corn oil is oil extracted from the germ of corn. It is rich in unsaturated fats and sterols, both of which can help lower blood cholesterol. Corn is a major source of both grain feed and fodder for livestock. 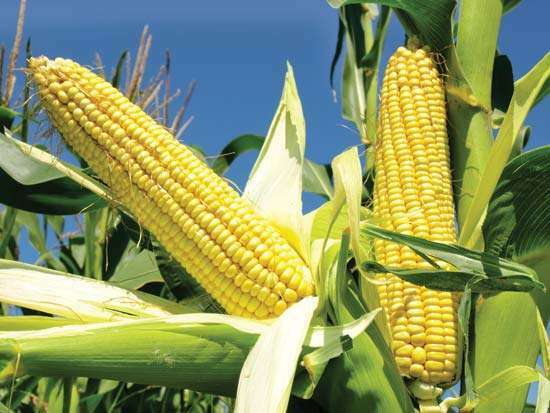 Corn is used for many nonfood items such as fireworks, plastics, fabrics, rust preventatives, glue, paint, dyes, laundry detergent, soap, aspirin, antibiotics, paint, shoe polish, ink, cosmetics and more. Corn is also used to produce ethanol (ethyl alcohol), a first-generation liquid biofuel. Before the 20th century, all corn harvesting was by manual labour. Corn is annual plant which means that it completes its life cycle in one year. The first mechanical corn harvester was developed in 1930 by Gleaner Harvester Combine Corporation of Independence, Missouri. In the United States, corn ears along with tobacco leaves are carved into the capitals of columns in the United States Capitol building.